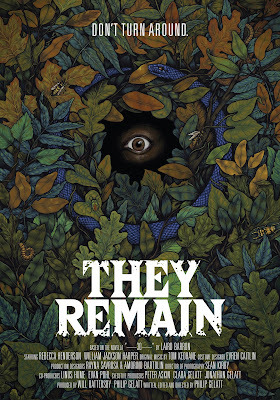 This is a new poster and trailer for They Remain. They Remain had its world premiere at the H. P. Lovecraft Film Festival in October 2017. It was written and directed by Philip Gelatt (Europa Report) and adapted from Laird Barron’s short story -30-. It will open theatrically New York (Village East Cinema) on Friday, March 2nd and Los Angeles (Laemmle Music Hall) on Friday, March 9th with a national release to follow. You can read our review here. Check out the synopsis and trailer below. "William Harper Jackson (True Story) and Rebecca Henderson (Mistress America) star as two scientists investigating the root of environmental changes and strange animal behavior at a remote site where a Manson Family-style cult committed atrocities. The isolated location, the unraveling of their relationship, and the biome itself begin to lead them down a path of doom where primeval forces threaten to consume them. Whether you’re a fan of author Laird Barron or a fan of cosmic horror cinema, you will not want to miss this screening."